It must be 80s week because after devouring A Summer's Day my next photo book was Hockney On Photography. This is basically an illustrated transcription of 5 years worth of conversations between David Hockney and photographer Paul Joyce that occurred in the mid-80s during the period Hockney --who made his name as a painter-- was experimenting with photo collages. I have to say this book has turned out to be much different than I'd expected when I first picked it up at Powell's. 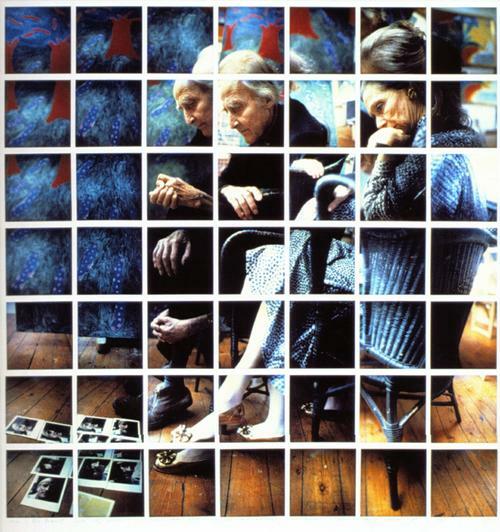 I've always liked Hockney's photo collages, especially the Polaroid grids. They show a very unique vision. The texture of the polaroids makes them feel somewhat like sculptures, and something about the Polaroid color in a grid with Southern California light is really magical. So I dove into the book with anticipation thinking it might shed light on his process. While the book offers insight into Hockney's process, what it does mostly is trash photography. Photography will never equal painting. Photography is only good for mechanical reproduction. Photography can't show time. Photography never did this and will never do that, etc. If you are looking for a pat-on-the-back book about how great it is to be a photographer, this ain't it. PJ: It's difficult to be an artist as good as you are and be able to cope with it, isn't it? DH: Yes. If I found it difficult, then everybody else certainly will...There's not that many people who are willing to spend that kind of concentration and time on one particular piece. DH: They are not used to it, no. PJ: I honestly think that photography is no longer the same after this work of yours. I'm absolutely convinced of that. DH: I know that. It cannot be the same, because so many things have been overcome here. The main obstacle Hockney thinks he has overcome is the limited perspective of a stationary camera. A single photograph can only show one point of view, usually for a small period of time. "All photographs share the same flaw," he says. "Lack of time." He then goes on to trace photography's misguided view back hundreds of years to the Renaissance and invention of the Camera Obscura. 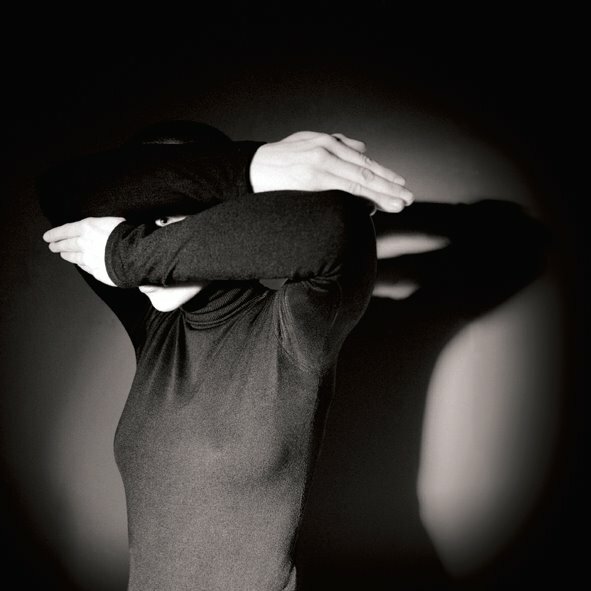 Cubism helped to topple the single perspective in the hand-arts, but with photography it still exists. 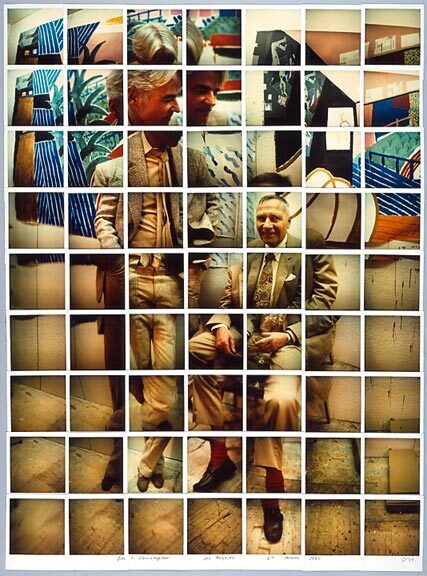 The idea behind Hockney's grids was to inject multiple reference points into photography, in short to make it cubist. PJ: There's something about photography which is deeply dissatisfying. And I've been struggling to pinpoint just what that is. The difference between what you might call a very great photographer and a very good photographer is not as much as the difference between a very great painter and a very good painter. I can think of the difference between Rembrandt and one of his contemporaries who you would call very good. The difference is still very great, whereas the difference between -- well, how many great photographers are there? Just name one and the difference between him and any other good photographer is much slighter. There are few good photographs, and those good ones that do exist are almost accidental. Photography has failed...How many truly memorable pictures are there? Considering the milllions of photographs taken, there are few memorable images in this medium, which should tell us something. Photography can't lead us to a new way of seeing. It may have other possibilities but only painting can extend the way of seeing. Overall, looking at this book is a bit like looking at an old photo. The 80s were already 20+ years ago --Has it really been that long?-- and there is a certain dated quality to the ideas and images, and to the cultural references. The glasses, the hairstyles, the colorful poolside lifestyle, it all whispers "80s" in your ear. The book would go well with Men at Work or Tears For Fears as background music. That said, sometimes photographs prove to be more interesting as they age, and the same can be said for this book. Hockney makes a few astute predictions about the impending digital era. This was in the mid-80s before Photoshopping had really taken off. But Hockney says that the arts and publishing will be revolutionized, and he turned out to be right. 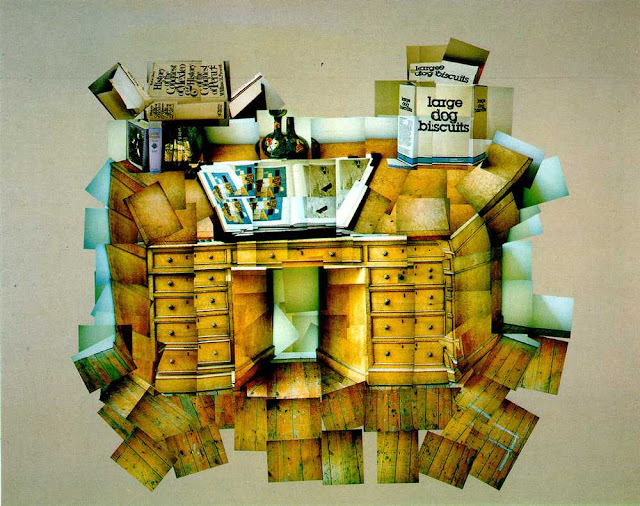 He delivers a prescient warning about computerized collage and its threat to photography's claim to reality. Alas his main prediction --that his grid style would revolutionize photography in general and that once people caught on everyone would do it-- didn't come to pass. It's odd that all the interviews of Hockney I've ever read, including most notably one by an otherwise intractable political comentator called Andrew Marr, his interviewers all toady up him shamelessly. great post, i haven't read this one and will have to do so now. Great thoughts you got there, believe I may possibly try just some of it. 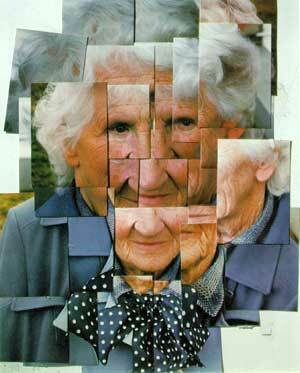 very useful for A level art research, now I can reference Hockney critically.